Austrian physician; born at Vienna Nov. 9, 1857. After attending the gymnasium and university of that city, he received the degree of doctor of medicine in 1880 and joined the sanitary corps of the Austrian army. As surgeon of the Teutonic Knights he took part in the Servian-Bulgarian war of 1885-86. He resigned from the army in 1890, becoming lecturer on surgery at the University of Vienna. Since 1893 he has been chief surgeon at the Vienna Karolinen Kinderspital, and since 1895 assistant chief surgeon of the general dispensary there. In 1896 Fränkel became editor-in-chief of the "Wiener Klinische Wochenschrift." 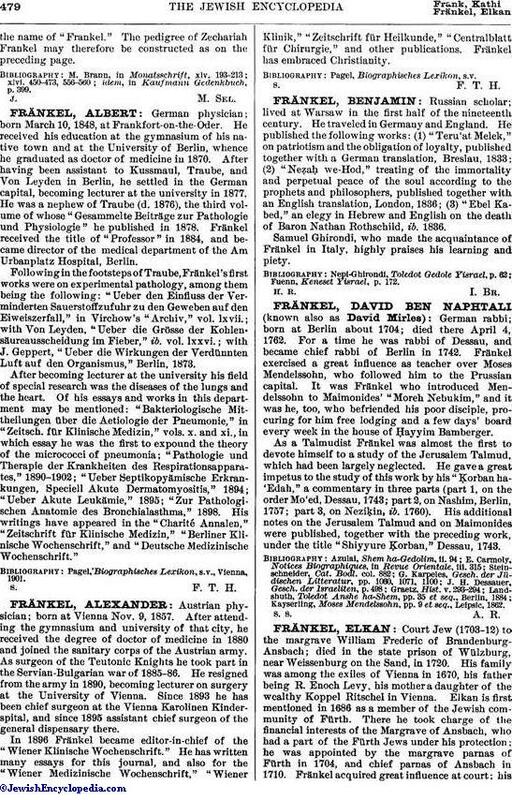 He has written many essays for this journal, and also for the "Wiener Medizinische Wochenschrift," "Wiener Klinik," "Zeitschrift für Heilkunde," "Centralblatt für Chirurgie," and other publications. Fränkel has embraced Christianity.